I use ranch seasoning a lot, especially while freezer cooking, but those little packets are pretty expensive and filled with unhealthy preservatives. So after collecting a ton recipes for my posts 30 Items You Can Make at Home to Save Money and 40 Groceries to Stop Buying and Start Making to Save Money, I was inspired to try my hand at making some of my own mixes. This is the first seasoning mix that I’ve tried making and I’m in love! It’s so nice to have it on hand and not have to worry about running out to the store, especially when I do bulk cooking and need a lot of it. I hope you love it as much as I do and I can’t wait to try out other mixes soon. Mix all ingredients and store in air tight container. 2 tablespoons mix = 1 packet ranch seasoning. Two tablespoons = 1 packet dry ranch seasoning. I will definitely try this. I've never had ranch seasoning (I live in Norway) but this sounds great! Oh, I love making my own convenience items like this! 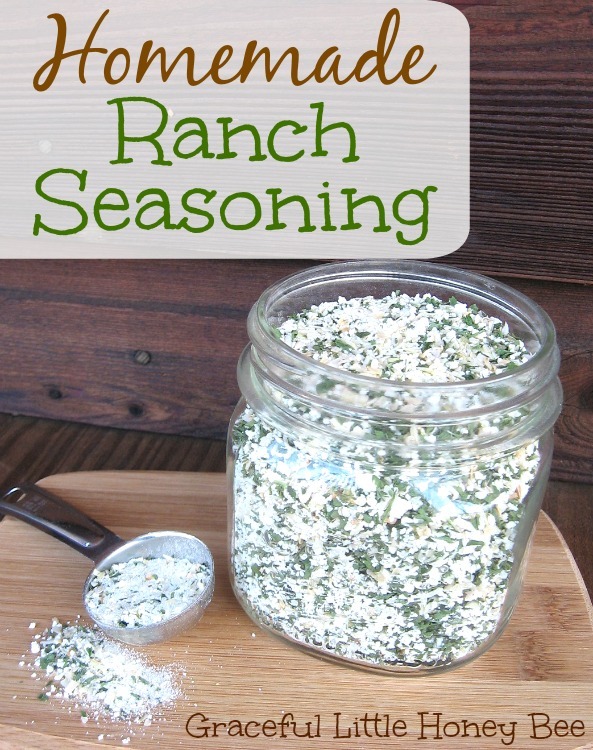 Have you ever made Ranch dressing with it? I've been wanting to try to make that homemade. I haven't made dressing with it since I normally use it dry for cooking. I would be sure to use the dried buttermilk if you want to use it as a dressing. When I make this dressing mix I don't put the buttermilk in because I usually never have any dry because I make my own. When I make it into dressing I mix it with a cup of plain greek yogurt thinned with milk. Same taste. To use for cooking I just use as is without the buttermilk. Great recipe, pinned for future and shared. Followed you from the From the Farm Hop, love for you to share on Real Food Fridays. How would you turn this from dry into a wet dressing? Sounds yummy! How long does it stay good in an air tight container? It should keep indefinitely since all of the ingredients are shelf stable, but you should probably use it within a year for freshness. Does it need to be refrigerated? My container of powdered buttermilk says refrigerate after opening so I'm curious if this mix should be since it's made with the powdered buttermilk?? I use regular powdered milk and don't refrigerate it, but if the buttermilk says to refrigerate then I would. Thank you so much for this recipe! I love those Ranch packets but hate buying them for all the reasons you mentioned in your post! I can't wait to try this out! I hope you enjoy it! And I love your site. I'll have to poke around some. :) Have a great weekend! Has anyone tried adding a little dill to this recipe? I can't wait to try this! Thanks! I love skipping the extra ingredients that are put into store bought things. I am going to try this next time I make our favorite pasta salad! It is amazing how much better you feel when you start to get away from processed foods.